Courses begin: April 1st and the days following in that week. 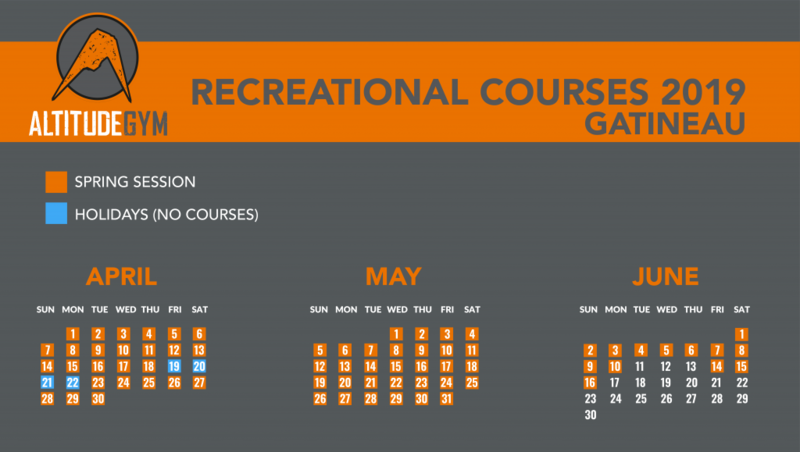 All courses are recreational level unless otherwise dictated, 10 weeks long and once a week. The course price includes the harness rental but not the climbing shoes. However, all participants must wear climbing shoes during the course. Shoes can be rented at the front desk for the 10 week course at the cost of $29.99 plus tax. These are rock climbing courses and the clip n climb isn’t included in any of the courses. Members get 10% of course registration. Register directly online by clicking on the links associated with your child’s category. This course introduces rock climbing through 10 basic techniques, games and practice to build confidence. The course develops more precise climbing skills through technical lessons, practical applications and specific games. This allows further improvement to climbing skills through application and reinforcing skills with more advanced technical lessons. This program is a twice a week program and could be a stepping stone onto the pre-comp team. This course develops more precise climbing skills through technical lessons, application and drills to practice skills and improve climbing. This introductory course is for people who are still new to rock climbing and looking for technical lessons and application with guidance from an instructor. For climbers with some experience already who are looking for skill refinement and more experienced technical application. Recommendation that you have taken the adult beginner course or have participated in more than 1 year of rock climbing on a regular basis.